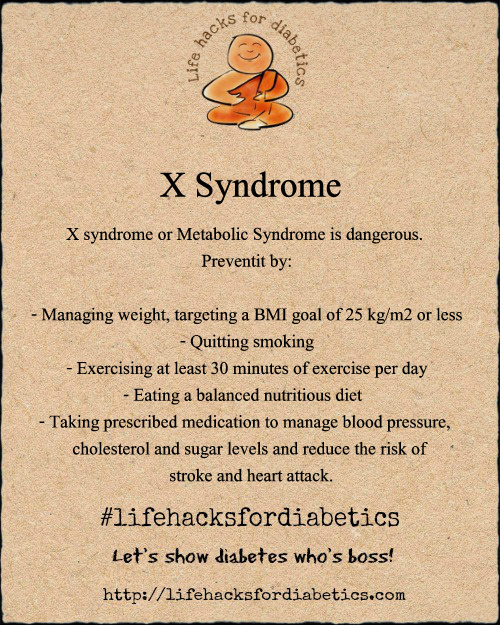 X syndrome or metabolic syndrome is a dangerous condition. Prevent X syndrome by Managing weight, targeting a BMI goal of 25 kg/m2 or less, quitting smoking, stepping up physical activity – at least 30 minutes of exercise per day and a balanced nutritious diet, medication to manage blood pressure, cholesterol and sugar levels and reduce the risk of stroke and heart attack. More about X syndrome here.